Who is Hayao Miyazaki ? Hayao Miyazaki was born in 1941 in Tokyo, Japan. He graduated in 1963 with degrees in political science and economics, although he had already decided he wanted to become a manga artist and work in animation. and is today a living legend for anyone working in the animation business. 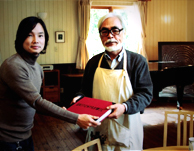 Hayao Miyazaki's drawing is on the last page of Sketchtravel. Miyazaki drew and painted it in 3 days, in January 2011. The drawing spreads over two pages and represents a young boy in front of a plane.